By Amanda. One thing I've really started to pride myself on is the term "keep it local". Our generation has really stepped up its game in creating everyday products that we use and love, and we no longer have to outsource to other countries for said products. Although some of these products may be a little more pricey - we are doing ourselves a huge favor by keeping our money right here at home and supporting each other. And I don't mind paying a little more for quality products made by hand with love. Below are a couple of my absolute favorite shops that I love and fully support. I've purchased all of these products and I just can't get enough of these makers and shakers! Shop local and support small businesses! Olfaction Candles - Made right here in the lovely Tampa Bay by my friend, Paige. Her candles have the greatest scent combinations, classy packaging and toxic free ingredients. The candles have mild, welcoming notes and I've yet to smell one that makes me crinkle my nose. Not only does she make just candles, she also makes homemade soaps, and face masks! Amelie Mancini - Out of Brooklyn, NY, Amelie makes the cutest little leather accessories that you ever did see. From coin purses to sun glass cases, her hand painted patterns are adorable and on trend. Jenny Highsmith - Based out of Atlanta, GA, her hand-lettering prints and home decor are stunning, and artistic. Light and Ink Studio - The coolest hand-stamped stump prints from central Utah. These prints are so unique and a fantastic conversation piece. Rich Hippies - Right in the heart of East Nashville, TN, Lana's handmade pieces are adorable to say the least. I'm a little bias with her Leather Plant Hangers as those were made by my super crafty husband. He's so creative its disgusting. You can also check out his Etsy shop here. Fox and the Fawn - The most delicate and unique pieces of Jewelry made in Las Vegas, NV by a powerhouse mom. This lady is a total boss and makes every single piece of jewelry BY HAND. Zoe Organics - A mother who decided one day to make her own products for mamas and babes. All natural everything, with sweet scents and great quality. She's created such a movement that you can now find her products at most Targets. Tubby Todd Bath Co - If you aren't familiar with the Faulkner sisters, then you aren't living. Andrea created the most amazing bubble bath/shampoo/body wash trio to initially help her children with eczema and it worked so well that she officially started distributing her products out of California for all of us mamas to get our hands on. Passive Juice Motel - The funkiest apparel and home goods, screen printed in Tulsa, OK. They have the coolest prints to suit small babes and big kids alike. 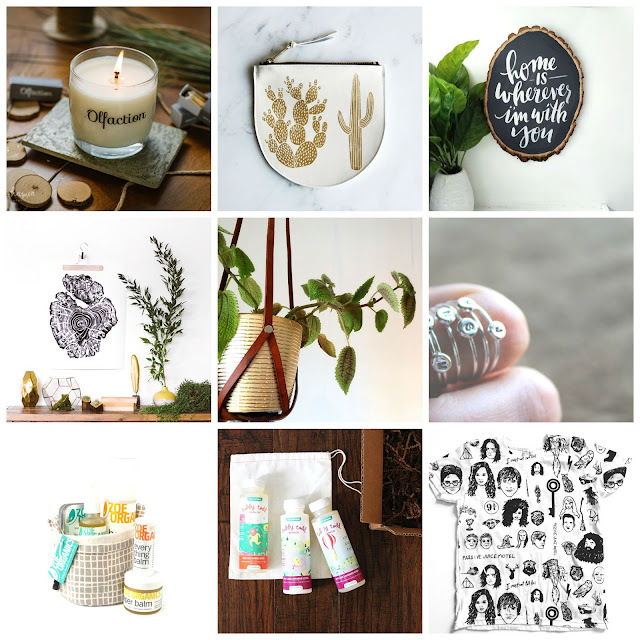 A cool thing that I discovered about our area here in Tampa is that Urban Outfitters, West Elm, and Anthropologie promote Etsy Pop-Up markets with local vendors who are doing their own thing on Etsy and in our community. And actually, on Etsy's homepage you will find a link that says Etsy Local - this will direct you to where you can find different markets, pop-ups and festivals going on supporting local makers. I encourage everyone out there to do a little digging, find products made with love in your community and support those makers! Love that "Home is wherever I'm with you" sign!